Restore your skin’s hydration, luminosity, and tone alongside volume with Teoxane’s range of Teosyal fillers. Perfectly suited for restoring your skin’s vitality and softness, Teosyal fillers rejuvenate facial skin while providing exceptional results, ideal for expressive, emotive parts of the face. Teosyal Fillers helps restore tired or drawn features, dull skin tone, lost radiance, wrinkles, and fine lines. And unlike other dermal fillers, Teosyal Fillers continue to work as a preventative measure for these issues in the future, complementing the body’s natural hyaluronic acid content. Teosyal fillers can be injected into all facial areas as well as the neck. 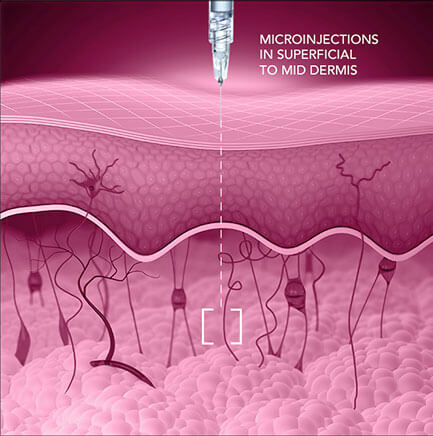 The hyaluronic acid (HA) within each injection is gradually released into and absorbed by the body, bonding with the body’s natural HA content. As we age, our bodies produce less HA. In turn, we lose that youthful vigor and glow. Mobile facial areas, or the parts of the face that see repeated movement, typically manifest some of these common signs of aging. Teosyal’s range of fillers are specifically designed to help preserve the natural characteristics of hyaluronic acid, preserving results and ensuring the mobile, active parts of your face enjoy the full effect. What are fillers? What is Hyaluronic Acid (HA)? Fillers are injectable treatments that revitalize and restore skin. Many dermal fillers use hyaluronic acid (HA), a substance occurs naturally in the human body, and helps your skin retain its youthful glow. Fillers help restore volume, tone, and look to aging or delicate skin, which loses HA as we age. Results typically last between 12 and 18 months, varying individual to individual and how the filler is administered. Be sure to discuss your options with your practitioner to get more details about what sort of results you can expect from treatment. HA injections should not be used in combination with peels, lasers, or ultrasound-based treatments. Furthermore, if you have any cutaneous disorders, inflammation at the treatment site, or infection, you should not have dermal fillers. If you have autoimmune diseases or conditions, or are pregnant, you cannot use this treatment. Contact SKINS Derma Care for more information on contraindications and other potential risks. No. While there is some discomfort, the needles used for injection are much smaller than those used for vaccinations or when taking blood samples. Typically, this minor discomfort only lasts for the duration of treatment, and rapidly resolves after it is completed. What constitutes a typical course of treatment? For optimal results, a treatment is typically 3 appointments spaced 3 weeks apart, with results visible even after the first session. We recommend booking a follow-up session in the year following your initial treatment. Some patients may experience swelling and bruising after treatment. Some swelling and a sensation of “tightness” in the treated area are normal side effects that quickly subside. Bruising can occur, depending on the individual, and we recommend pre- and post-treatment topical relief solutions to our patients to help mitigate this uncommon side effect.